Utah Mayor Identified As Service Member Killed In Afghanistan Maj. Brent Taylor, mayor of North Ogden, a small city in Utah, was identified as the U.S. service member killed in Afghanistan. "We feel blessed to have had him as our mayor," the city said. Afghan cadets attend a graduation ceremony at the Afghan Military Academy in Kabul. Saturday's "insider attack" is the third time an Afghan soldier has killed an American counterpart this year. Maj. Brent Taylor, mayor of North Ogden, a small city in Utah, was identified as the U.S. service member killed in an attack in the Afghan capital of Kabul Saturday morning. "Brent had a profound influence on this community," North Ogden's city website wrote. "He was the best of men with the ability to see potential and possibility in everything around him. We feel blessed to have had him as our mayor. Everywhere you look in North Ogden you can see his profound influence. He had a great love and vision for this community. He was patriotic to the core and a shining example of what an American politician should be. We are grateful for his service to both our city and our country. His loss will be felt for years to come." In 2009, Taylor was elected to the city council before campaigning to become mayor of the city in 2013. According to the city council website, Taylor graduated from Brigham Young University in 2006. He received his masters in 2012 from the University of Utah in public administration. He was pursuing his doctorate degree in international relations from the University of Utah. Taylor had stepped away from his role as mayor temporarily to deploy to Afghanistan with the Utah National Guard. He had served more than 12 years in the U.S. Army National Guard as an officer with more than seven years of active duty, according to his biography. Taylor is survived by his wife, Jennie Ashworth Taylor, and seven children, according to Utah Lt. Gov. Spencer Cox. "Utah weeps for them today," Cox wrote on Twitter. Cox conveyed what he said was part of Taylor's last post to Facebook: "As the USA gets ready to vote, I hope everyone back home exercises their right to vote. We have far more as Americans that unites us than divides us. United we stand, divided we fall. God Bless America." The attacker had been a member of the Afghan National Defense and Security Forces, NATO said in a statement. Other Afghan soldiers killed the attacker immediately, NATO said. "I am heartbroken at the news that we lost one of our own today in Afghanistan and feel completely humbled by the service and the ultimate sacrifice offered by this brave and selfless soldier," Utah Gov. Gary Herbert said in a statement on Saturday. "The entire Herbert family mourns with this soldier's family and we pray that their burdens may be lifted, and that the hearts of all Utahns will reach out to comfort them in their grief." NATO described another service member who was wounded in Saturday's attack, who had been airlifted to Bagram Airfield, as being in stable condition. This is the third time an Afghan soldier has killed an American counterpart this year, known as an "insider attack," reporter Jennifer Glasse tells our Newscast team. Defense Secretary Jim Mattis said in September that Afghan forces would increase vetting in response to these attacks. "They are bringing in more people that we have helped train to know how to do it, to make certain we're catching people who have been radicalized," Mattis told reporters, according to Reuters. Insider attacks are among the many data points that can track the progress of the 17-year war in Afghanistan. At their peak in 2012, there were 44 such attacks, Jennifer reported. "We think the reasons for these attacks are complex," Gen. John Allen told NPR's Tom Bowman in 2012. At the time, Allen was the top American commander in Afghanistan. He told Tom that insider attacks could be sparked by Taliban infiltrators, disputes between NATO and Afghan security forces, and even the timing of Ramadan, the Muslim holy month. In 2012, as the U.S. drew down the number of troops from its high of about 100,000, there were between 70,000 and 90,000 American troops in Afghanistan. Earlier this year, NPR's David Welna reported the number was between 14,000 and 15,000. 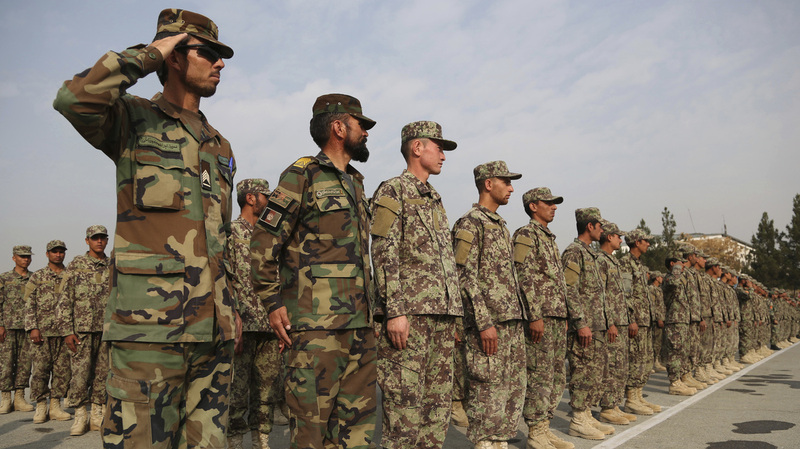 U.S. officials have continued to stress that Afghan security forces are crucial to American success in Afghanistan. "The Afghan security forces are incredibly brave and courageous," Gen. John Nicholson told Rachel Martin on Morning Edition. "They need our help, though." Nicholson commanded U.S. and NATO missions in Afghanistan from March 2016 to September 2018. He said Afghan security forces had noticeably improved in recent years — especially Afghanistan's special forces and air force. "The reforms they're doing internally — the retiring of older officers, the professionalizing of their force — it's a new army," Nicholson told Rachel. "It didn't exist when the war began." In another notable insider attack last month, an Afghan guard shot the American general in charge of training and advising Afghan security forces in Kandahar. Brig. Gen. Jeffrey Smiley was shot twice in his limbs, Tom reported. That attack killed two high-ranking Kandahar officials and wounded several others, including the province's governor and two Americans. The top American commander in Afghanistan, Army Gen. Scott Miller, was also present at the meeting but escaped without being harmed.